I had never really considered the Maldives as a photography destination: what could I want to take pictures of on an island of 200 square metres? Precisely for this reason, I decided to travel to a remote atoll to take a well-earned break, far from the chaos of the city, horrible dawn wake-up calls, hours spent waiting for the perfect sunset and editing photographs. Or at least, so I thought: the idea of an idyllic holiday of total relaxation was transformed into a photography trip on which, in just 6 days, I shot 70GB of photos for 3 resorts, took 8 flights, 2 seaplanes and 4 boats. Definitely better than 6 days roasting on the beach, don’t you think? 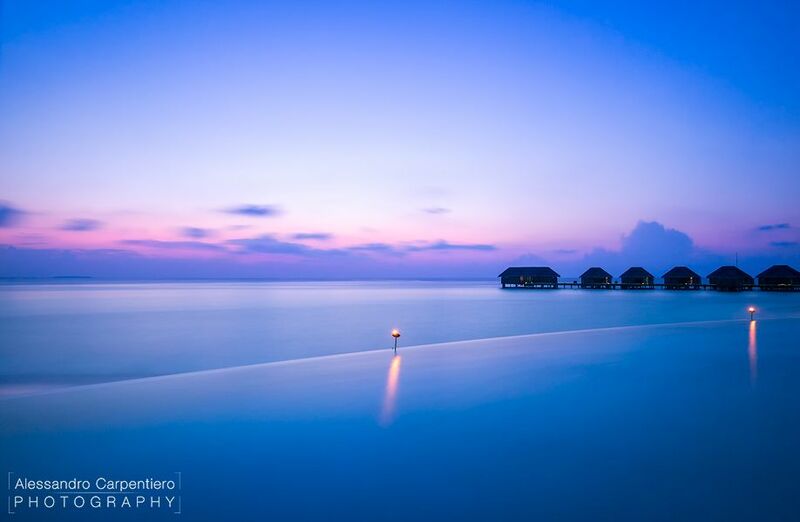 The Maldives are known as the Relaxation Paradise, but I can assure you that they are also the Photographer’s Paradise. In fact, even on little islands you can find a vast array of subjects that lend themselves to different genres of photography. So, during this trip, I wanted to put myself to the test, trying to create shots that went beyond the typical “sea, beach & palm trees”. No sooner said than done, the first sunset I found before me was decidedly different from that usually associated with the Maldives. The sky was completely covered by thick clouds that hid the descending sun, so I couldn’t photograph it going behind the horizon; but I wasn’t going to be beaten, and I waited for the blue hour. As often happens, knowing how to wait can make all the difference. 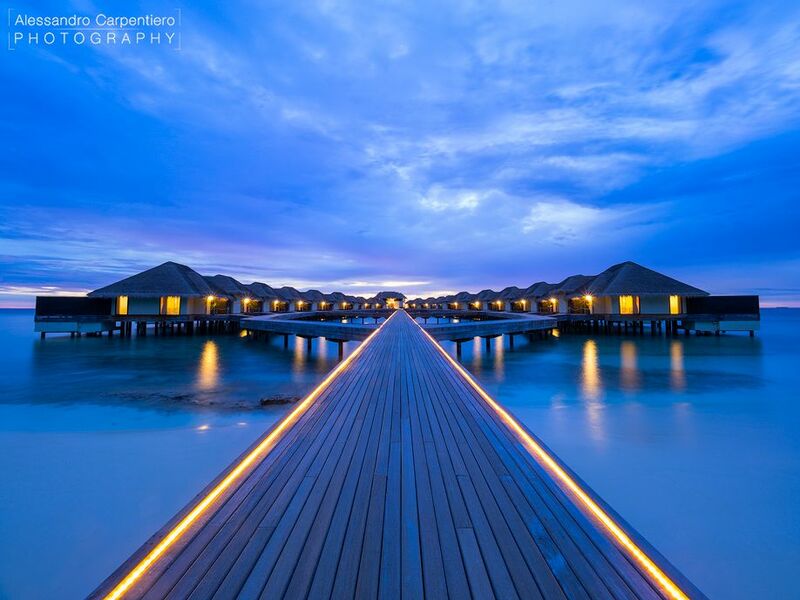 For this shot, I decided to contrast the calm of the On Water Villas with the threatening sky: to shoot the sea as a totally flat surface, I used a shutter speed of 25s, using an ND filter that removed 6 light stops. For such a slow shutter speed, a tripod was essential, and in this case I chose the Manfrotto BeFree Carbon. This is because the carbon fibre absorbs micro-vibrations must better than aluminium (that could be felt on the wooden bridge on which I was standing); as well as that, its reduced weight and compact size enabled me to travel around the island easily. Trust me, at 30°C and with 90% humidity, you feel every ounce of your equipment. The following morning, after a night of rain, this was the view from my room. The sense of calm is absolute, as is the silence interrupted only by the sound of the small waves breaking against the stilts. In situations such as these, the scenario requires no further assistance; all you have to do is click the shutter. Try experimenting with a polarising filter to enhance the colours and transparency of the water. As well as the beauty of the nature at is simplest and most pure, I also got to photograph the interior of some incredible villas. 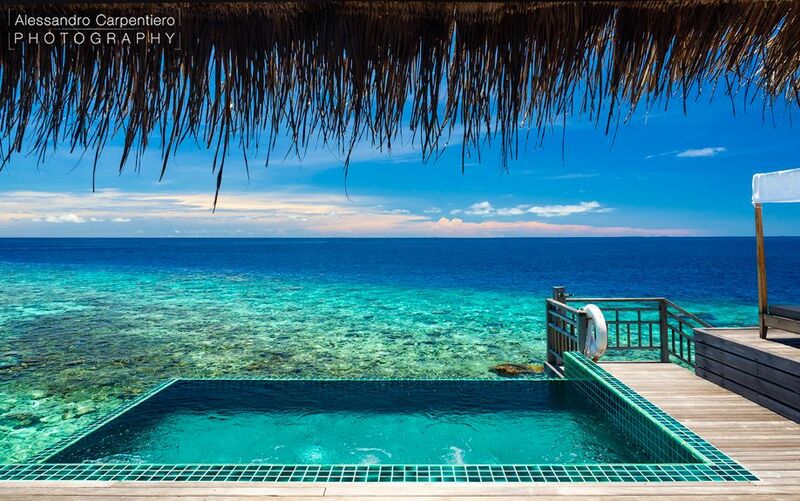 Indeed, all the resorts in the Maldives strive for extremes of perfection, luxury and exclusivity, more than any other destination I have photographed so far. 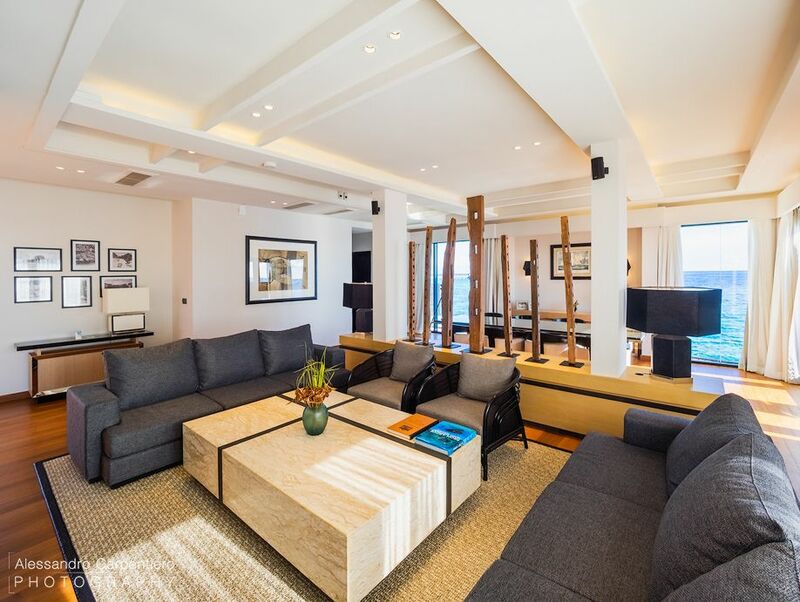 In this shot, for example, you can see the living area of a Presidential Suite at the Outrigger Konotta Resort; we’re talking about 600 square metres at $6,000 a night. If you follow my work, you’ll know that I’m also a big fan of aerial photography. Everything changes from above: perspective, light and dimensional relationships are expanded, allowing us to discover a new photographic dimension. 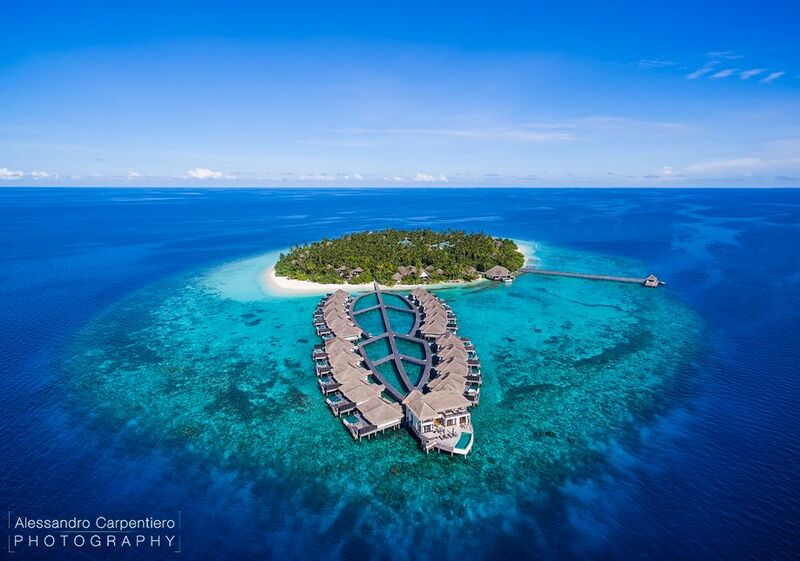 As you can see, the Maldives absolutely delight in aerial photography. In this shot, you can admire the whole of Konotto resting on the coral reef and surrounded by the big blue. See the big villa on the sea? That is the presidential suite I showed you earlier. About 500km further north, on the island of Mudhdoo, I wanted to capture the sunset again, but this time with a photograph that combined in harmony the architecture of the resort and the purity of the landscape. Whilst exploring, I had noticed the lines created by the Infinity Pool at the Dusit Thani Resort, and thus I decided to use it for the shot I had in mind. Here again, the moment of sundown was covered by the clouds on the horizon but ,immediately afterwards, the sky was tinged with blue and pink, and the effect was truly magical. To achieve this effect, I used an exposure of 105s, mounting my camera on a Manfrotto 055 XPROB. I chose this tripod for its height, which allowed me to keep the tables situated around the pool out of the frame. Photographing the beauty of the Maldives was most certainly an unforgettable experience that was both intense and rewarding. It wasn’t the week of relaxation that I had had in mind: it was much, much more. Alessandro Carpentiero is a photographer who specialises in Travel and Architecture. He started sharing his pictures on Instagram whilst working as a designer; his popularity grew and led to him collaborating with internationally famous brands. 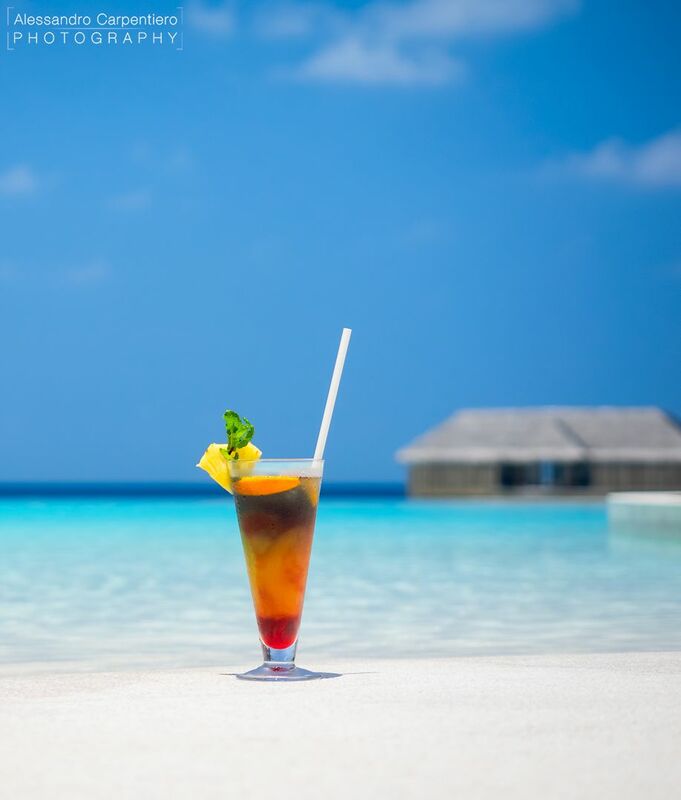 He is now a full-time photographer and he travels around the world taking pictures of the beauty of our planet and documenting prestigious hotels and resorts.